Lego minifig customizer and photographer Julian Fong–a.k.a., the grown-up equivalent of the kid I would have made friends with in grade school just so I could play with his awesome toys–has created an impeccable custom Lego minifig for just about every* superhero of note from the DC Universe. The Justice League, the Teen Titans, the Justice Society… even Elseworlds characters like commie Superman from Red Son get a treatment. The photo above (click on it for a zoomed-in look) only includes some of Julian’s minifigs; visit his Flickr photostream for a close-up look at all of his work. Via Comics Alliance, who hopes those pinko commie Lego minifigs enjoy standing in their Lego breadlines. USA! USA! * Angry nerds, feel free to tell me in the comments which heroes Julian excluded, so we can argue over the subtleties of “of note.” That’ll be both fun *and* productive. I would buy ALL of these, even if I ended up in a cardboard box. 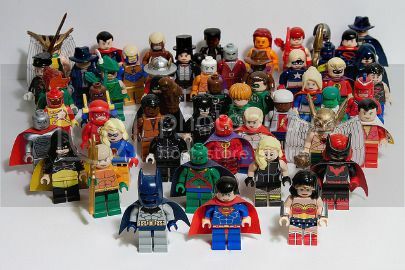 At least I’d have my superhero minifigs. Wow…I vote he markets these…there’d be lots of buyers.